In the Search for Individuals or Groups to Add list, type the first few letters of a person’s or group’s name. Then select the name from the list. 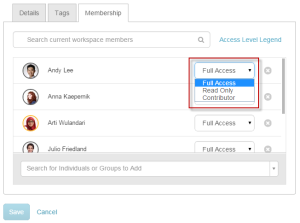 Next to the person’s or group’s name, select the access level that the person or group should have for the workspace.